Aliens are cool, but what about being hunted by velociraptors, shape-shifting aliens, and cyborg assassins? Movie adaptations don’t get any better than The Creative Assembly’s Alien: Isolation. It isn’t just the best horror game on PC, but also a lovingly crafted and fanatically faithful recreation of Ridley Scott’s sci-fi classic. It got me thinking about what other films deserve to be adapted with the same passion for the source material, using dynamic, unpredictable enemy AI to make you feel like you’re being hunted by a fiercely intelligent predator. And I think the following flicks would be a perfect fit, even if the chances of them actually being made are about as slim as there ever being a good Alien movie again. A team of researchers in Antarctica encounter a shape-shifting alien that can perfectly mimic any living organism it consumes, including humans. The slow, tense pacing, claustrophobic setting, and that eerie, brooding Ennio Morricone soundtrack would make for a wonderfully atmospheric horror game. 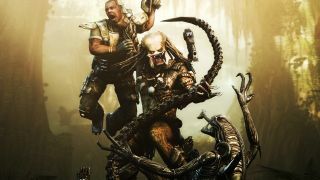 Knowing other survivors could be the alien in disguise would let you experience the same grim paranoia as the characters in the film, and being chased by those gruesome, half-transformed Stan Winston monsters would be terrifying. A squad of elite soldiers on a mission in Central America are stalked through the jungle by a powerful alien hunter. McTiernan’s action classic, which ends with hero Dutch (Arnold Schwarzenegger) outsmarting and defeating the technologically advanced creature with primitive, improvised traps, is the perfect setup for an Isolation-style game. Stripped of his weapons and gear, Dutch has to use ingenuity and creativity to beat the predator, and I love the idea of this being translated into a systems-driven horror/stealth game. Disaster strikes a theme park when its attractions, genetically engineered dinosaurs, break free and start killing guests. To imagine how an Isolation-style Jurassic Park game would work, think of the scene at the end of Spielberg’s movie where Tim and Lex are hunted by a pack of velociraptors. The idea of being alone on Isla Nublar, in the destroyed remains of Hammond’s park, dodging raptors and other hungry carnivores as you look for a way home sounds like a perfect setup for a game. I’m devastated it doesn’t exist. In this neo-noir thriller, a man finds a suitcase full of money in the desert and is hunted by a ruthless hitman hired to recover it. Anton Chigurh (Javier Bardem) is one of the scariest, most unsettling villains in movie history: cold, intelligent, resourceful, unrelenting, and seemingly unstoppable. Now imagine a game where you’re being pursued by him (and that silenced shotgun) across stark Western landscapes, trying to reach some distant location, knowing that he’s always on your tail, waiting for you to make the mistake that will end you. No, not the new HBO series, but the original ‘70s film. Set in a theme park simulation of the Wild West populated by lifelike robots, Crichton’s movie ends with unlikely hero Peter Martin being stalked by the cold-eyed Gunslinger (Yul Brynner), a malfunctioning android. The Gunslinger is terrifyingly, calmly relentless, and I love the idea of an Isolation-style game where you’re the last guest in Westworld being hunted by a superhuman robot that has taken a dislike to you. Bonus points if the game matches the movie’s ‘70s aesthetic. A cyborg assassin from a dark future where humans and machines are at war is sent back to the 1980s to kill Sarah Connor, the mother of a resistance leader. Terminator 2 is arguably a much better film, but the darker, grimier tone of the original would fit the Isolation mould better, I think. Imagine playing as Connor (before she could do pull-ups) and being stalked through the neon-lit nightclubs and shadowy backstreets of ‘80s Los Angeles by the T-800, with a downbeat, Brad Fiedel-inspired synth soundtrack humming in the background. A caretaker and his family are trapped in a remote, haunted Colorado hotel. I’m imagining a game where you play as Danny or Wendy in the final act of the film, when Jack is on his murderous rampage. As well as avoiding and outsmarting Jack, you also have the hotel’s spirits to deal with, who conjure up gruesome, disturbing images to try and unnerve you. Or maybe it’s set in the present day and another family finds themselves at the mercy of the old hotel. A grand, snowbound mountain hotel would be the perfect setting for a horror game. A college student is hounded by an invisible presence that only she can see, and that will kill her if it touches her. This is an incredible horror film, up there with the classics in this list, and would make for a superbly tense, terrifying game. The scariest thing about It Follows is how the ghostly ‘it’ can appear as a human, and you’re never sure if the person approaching you is after you, or just a regular person. This could become an interesting game system, forcing you to be constantly aware of your environment and the people around you. The Borg travel back in time to stop humanity’s first contact with the vulcans, thus preventing the formation of the Federation and making us easier to assimilate. Or something. Look, this movie is bad, but the part where the Borg occupy the Enterprise would be perfect for an Isolation-style game. You could play as some minor, gifted ensign, sneaking through Jefferies tubes, cobbling together improvised tech to mess with the Borg, rescuing crewmates, and maybe delivering some vital intel to the bridge that will help save the ship. Following the events of Aliens, Ellen Ripley wakes up on prison planet Fiorina ‘Fury’ 161 to discover that another alien is on the loose. For the record, I love Alien 3 and think its bad reputation is thoroughly undeserved. So that’s why I’d like Sega or someone to make an absolutely wild financial risk and set an Isolation sequel on Fury 161. It’s a brilliant setting for a horror game, and a nice contrast to the cold, grey, Nostromo-inspired Sevastopol. I also like the idea of having to deal with violent, unruly prisoners as well as the alien.